One of the strangest things that I have encountered is the belief that Adam and Eve were Jewish. Funny you say? Try asking someone about the Sabbath and they will say, “It is for the Jews.” However, when God gave it, not a single Jew was around, just Adam and Eve and neither one was Jewish. Whose Sabbath is it anyway? And who was it given for? 1. When was the Sabbath instituted? NOTE: The crowning act of creation was the Sabbath. 2. Who was it made for? 3. How did God make it special? NOTE: Only the Sabbath day is blessed, sanctified and hallowed. 4. Can the blessing of the Sabbath be transferred to another day? 5. What is the Sabbath a sign of? NOTE: Besides circumcision which was given to the Jewish nation, the Sabbath is the only think that is stated as a sign between God and His people. 6. What was Jesus’ Sabbath custom? 7. What did the followers of Christ do on the Sabbath after His death? 8. Which day did Paul keep, after Christ death, resurrection and ascension? 9. Which day did New Testament Gentile Christians keep? NOTE: Some teach that New Testament Christians worshipped on a different day from the Jews; however, this is not true. Jews and Gentiles worshipped on the same day (Sabbath) and the same place. 10. According to the Bible, the Sabbath is found between which two days? "And that day was the ____________, and the Sabbath drew on" (Luke 23:54). “And when the Sabbath was past, Mary Magdalene, and Mary the mother of James, and Salome, had bought sweet spices, that they might come and anoint him. And very early in the morning the ______ day of the week, they came unto the sepulchre at the rising of the sun.” (Mark 16:1, 2). 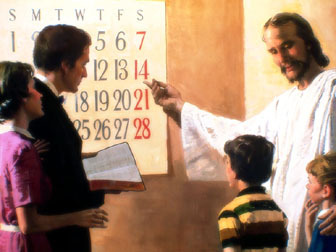 NOTE 1: The Sabbath of the New Testament is found between Friday, the preparation day and Sunday, the first day of the week. NOTE 2: Some ministers attempt to say that when the text says, “When the Sabbath was past,” that it meant that the seventh day Sabbath had ended and a new Sabbath was instituted. The only problem, however, is that Paul; some thirty years later not only kept the seventh day Sabbath, but also taught the Gentiles to observe it. 11. How do the wicked treat the Sabbath? 12. Does the Sabbath ever end? “For as the ____ ________ and the ____ ______, which I will make, shall remain before me, saith the LORD, so shall your seed and your name remain. And it shall come to pass, that from one new moon to another, and from one Sabbath to another, shall all flesh come to worship before me, saith the LORD.” (Isa. 66:22, 23). NOTE: Like God, the Sabbath is eternal. We will keep it in heaven and the earth made new. 13. Do you want to be among God’s people who believe Him and have His Sabbath sign?